CLICK HERE to check out other acts performing a Twilight Concert at the Santa Monica Pier! 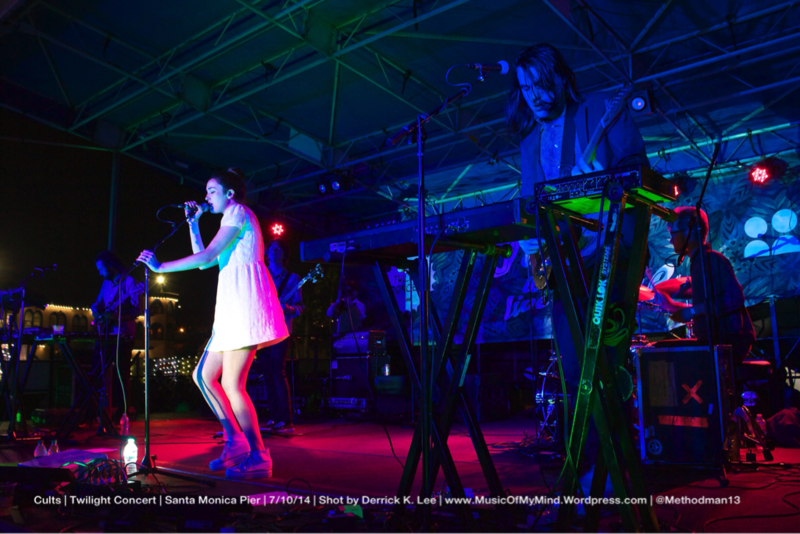 Headlining the first concert of the 2014 Twilight Concert Series at the Santa Monica Pier was the lo-fi, psychedelic, indie pop duo Cults. Madeline Follin and Brian Oblivian’s 60’s infused, experimental pop music received great acclaim in 2010 and 2011 with strong reviews by publications like NME and Pitchfork. I was particularly attracted to their latest album “Static” (released in 2013) as it basically told the story of the duos tumultuous relationship, which ultimately didn’t last. The darkness and somber tones of the music and lyrics of that album, for me, is a great straight listen (meaning, you can press play on the album and not have to fast forward any of the songs). However tumultuous their break up may have been, it was obvious that any personal antagonism between them had been squashed as there was no tension between the two while performing. In fact, the only tension I could sense was with the person working the mixing board as I could tell Madeline, perhaps, had a difficult time hearing herself. Was it just me, or were there no monitors on stage? The Cults’ music, especially with their latest release, is quite intricate and layered with sound. And where the recordings delicately balanced the music against the vocals, with the vocals at times just hovering over the music, the mix for their performance had the music slightly overpower the vocals. For example, when the instrumentation was minimal, like on the verses of “So Far”, I could hear Madeline’s vocals just fine. But when there was a swell of music, it often drowned out the vocal performance. Despite any hiccups with mixing, Cults powered through their set and performed all of their hits from both their first and second albums, and even returned to the stage for an encore. Having grown up in Southern California, they thanked the crowd and expressed their sincere appreciation for being able to perform back in their stomping ground. CLICK HERE to check out a collection of Instagram videos of most, if not all, of the songs Cults performed at this concert.